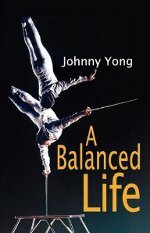 A slim, perfunctory little book, A Balanced Life is the autobiography of Johnny Yong, an acrobat and handbalancer who performed with his siblings as The Yong Sisters and Brothers, The Yong Brothers and Sister, or the Yong Brothers, and who toured the casinos, circuses and high-profile venues of the world in the 1950s, 60s and 70s. I had performed for royalty. I had performed alongside entertainers that make the term great seem minuscule. How does one appropriately describe sharing a stage with Marlene Dietrich? Subsequently, how does one say without complete embarrassment (or with humility) that she would become just one of the many greats that I had the privilege of working with? There is, as well, a lot of shying away from descriptive prose, interesting digression or personal reflection: ‘My first month with Ringling can’t be described, it has to be seen [a big list of tour dates follows]’, ‘being in Korea could only be described as far from pleasant’, ‘It was Radio City Music Hall. A venue with no adjectives to describe it.’, ‘I was born in a period of extreme hardship that I am not able to narrate’, etcetera, etcetera. I’m sure Johnny Yong has interesting and vivid memories of all those places and periods - tactile, emotional, rich recollections - but they aren’t expressed here, and mostly the book left me wishing a journalist or external biographer had captured the man and his stories through interviews, adding the necessary perspective, bridging the narrative gaps, and digging deeper into an unusual and eventful life.